We rarely think about what it actually feels like to wear cool sci-fi armor but Star Wars and Pacific Rim 2 actor John Boyega has become an expert on the matter. The verdict he gave on his mech pilot suit from Pacific Rim Uprising in an exclusive interview with our sister publication Total Film magazine? A resounding "ouch". Still, it's probably not the most cramped spandex-and-plastic getup he's ever poured himself into. "Oh, it's the worst thing," Boyega said, laughing. "It's just... oh my gosh, it hugs on to you, it really does. I think I preferred the stormtrooper [costume], which is crazy. Maybe I don't. Actually, you know what, maybe I don't. At least I'm flexible in this!" Subscribe: Pick up a subscription to Total Film magazine and get stories on Pacific Rim, Star Wars, and more delivered straight to you - digitally or physically! Compare the jaeger pilot's armor from the original Pacific Rim to the version in Uprising and you'll see the newer model is more sleek and form-fitting (the old one looked a bit like space marine armor crossed with a diving suit). Boyega's co-star Scott Eastwood helpfully observed that "they did make a little zipper for us," which made bathroom breaks slightly more tolerable for them. You can see more of the film's visual direction in these exclusive Pacific Rim 2 images. Those clingy mech pilot uniforms demonstrate the growing influence of giant robot predecessors like Neon Genesis Evangelion on the Pacific Rim franchise (maybe not quite G Gundam, which literally shrink wrapped its heroes into their suits). That's just one example of how there may be even more love for Japanese animation in Uprising than in the first film. When Boyega was working on his fight training and choreography, he had a pretty specific direction in mind. "I love the combat in anime," Boyega said. "The way it shows you all the intricate pieces, the hand-to-hand combat. So I wanted more of that approach, making it just more fun and visually breathtaking." Speaking of the stormtrooper connection, Boyega worked with Liang Yang, who you may remember as the stun-baton wielding 'trooper from Star Wars: The Force Awakens, in training for this film as well. 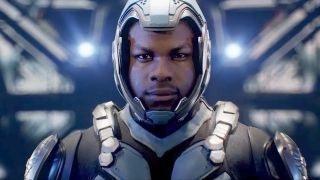 Pacific Rim Uprising will hit theaters on March 23 but you don't have to wait nearly that long to learn even more about it and other big movies. Just pick up a copy of Total Film magazine from your local mag purveyor, and get yourself a nice subscription deal for next time.